A mega-retailer, a mega-healthcare company, and a mega-infrastructure owner you can count on for steady income. Dividend stocks can make for wonderful investments. But like any other stock, it's important to have a good understanding of the underlying business you're buying into. After all, even the best company can see its stock price move up and down quickly, when the market gets riled up. But if you have a solid understanding of the business itself, that can go a long way toward helping you make the best investment choices, as well as avoiding stocks you may have to watch more closely than you really want to. If you're looking for solid, dependable dividends from companies you don't need to keep a constant eye on, we have identified three of the best. Brookfield Infrastructure Partners L.P. (NYSE:BIP), Target Corporation (NYSE:TGT), and Johnson & Johnson (NYSE:JNJ) are three very different businesses with almost no overlap, but all three are the kinds of investments you can make and not feel like you need to check on first thing in the morning. Keep reading to learn more about these no-babysitting-required dividend stocks. Jason Hall (Brookfield Infrastructure Partners L.P.): Toll roads. Power transmission lines. Ports. Natural gas pipelines. Not only are these assets people depend on every single day while never thinking about, but they can make for fantastic income investments. And that makes Brookfield Infrastructure Partners an ideal choice for income investors who don't want too much excitement in their portfolios. To start, many of the assets Brookfield Infrastructure owns and operates are important or even necessary in almost any economic environment. They are recession- and inflation-resistant, often have little to no competition, and generate steady, recurring cash flows. And that, frankly, is pretty exciting, even if it does come from a business that won't keep you awake at night. 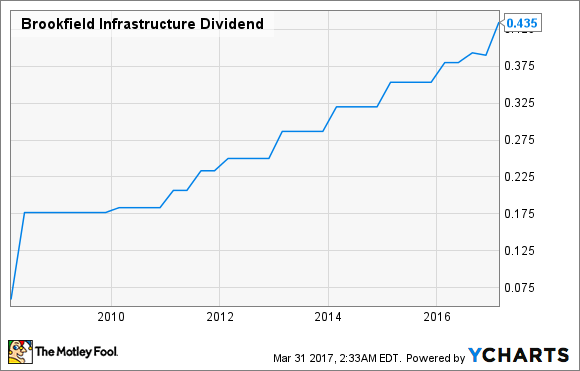 And with a current yield of over 4%, Brookfield Infrastructure is a solid investment you can make now. Just keep in mind that since it's a master limited partnership, it's not an ideal investment for your tax-advantaged retirement accounts. Anders Bylund (Target Corporation): What do income investors get out of a stake in retail giant Target? Plenty. And you can leave the antacids on the store shelf. The company has increased its dividend in each of the last 49 years. For those playing along at home, that streak started in 1968. Annual payouts have grown fivefold in the last 10 years, but the dividend budget still sits at a comfortable 35% of Target's trailing free cash flows. That leaves lots of room for further payout increases in coming years. Target is experiencing some turmoil these days, as management adjusts to an increasingly online consumer experience. The online shopping platform has been streamlined, local stores will be used as distribution centers for e-commerce orders, and the online experience is even being baked into the bricks-and-mortar shopping format. In other words, Target is not taking this new market environment sitting down. The company has been around for 115 years, made it through disruptions such as two world wars, the rise of credit card payments, and those newfangled shopping malls dotting the American landscape. None of these market changes killed Target, and management is taking effective action to hang around after this latest upheaval as well. So we have a centennial survivor with a five-decade commitment to dividend increases, poised to do well in a changing market, and sporting a generous 4.5% dividend yield right now. If Target isn't a safe dividend play, I don't know what is. Cory Renauer (Johnson & Johnson): Looking for a stock you can count on to increase your dividend income and decrease your desire to constantly check up on your portfolio? If so, you can hardly do better than the world's largest healthcare company. A combination of iconic brands and a leading position in several medical device segments provides stability during inevitable market downturns. It's also delivered over three decades of adjusted earnings growth with a pharmaceutical segment that boasts some of today's best-selling drugs, and perhaps many of tomorrow's as well. This unique combination has allowed the company to treat its shareholders to 54 annual dividend increases in a row. You'll be happy to know there's plenty of room for further increases. Last year, J&J generated $15.5 billion in free cash flow but used just $8.6 billion to make dividend payments. This allowed the company to invest about $5 billion in the form of licensing deals and acquisitions. One example of a previous licensing deal that turned out quite well is the $150 million it paid upfront for rights to blood-cancer drug Imbruvica about five years ago. Last year, J&J's share of Imbruvica sales reached $1.25 billion, an 82% increase over the year before. In 2017 the company anticipates FDA approval for two immunology drugs, guselkumab and sirukumab, both of which are expected to generate over $1 billion in annual sales. Further out, a robust pipeline of clinical-stage hopefuls should make continuing its streak of annual dividend payout bumps a breeze.